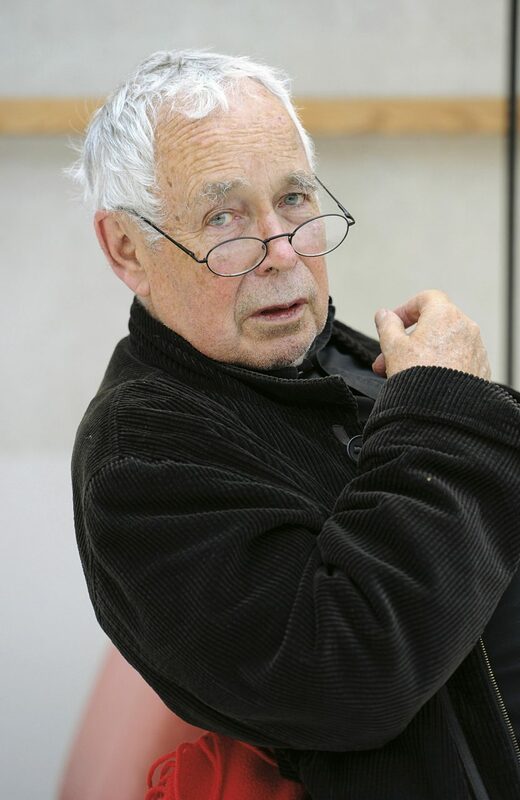 “It is with great sadness that we report the death earlier today of Howard Hodgkin peacefully in hospital in London. 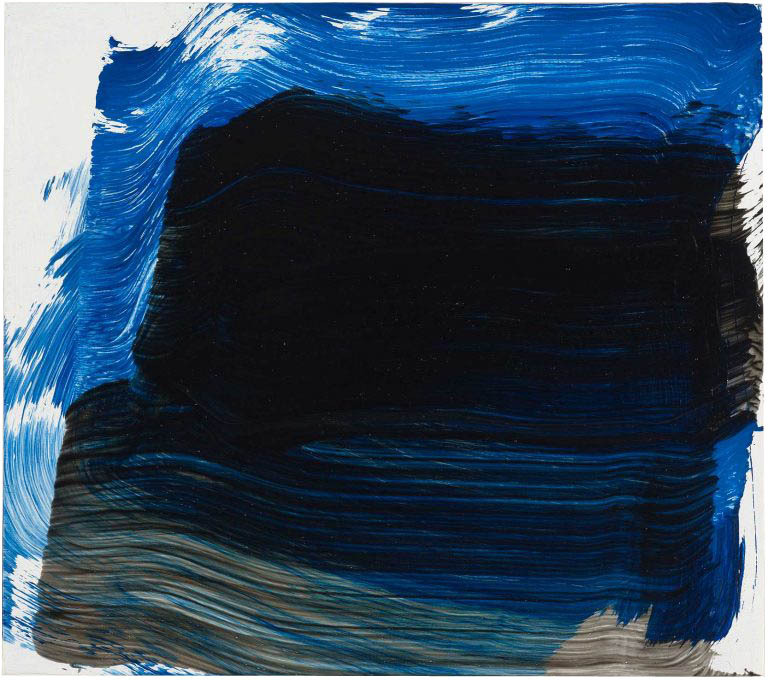 Howard Hodgkin is widely regarded as one of Britain’s greatest artists and has been a central figure in contemporary art for over half a century. He was born in London in 1932 but as a child was evacuated to America during the war. He studied at the Camberwell School of Art between 1949 -50, followed by the Bath Academy of Art between 1950-54, where he later taught for many years. He served as an influential trustee of Tate (1970-76) and the National Gallery (1978-85). In 1984 he represented Britain at the XLIVenice Biennale and he was awarded the Turner Prize in 1985. His first retrospective was curated by Nicholas Serota at the Museum of Modern Art, Oxford in 1976. 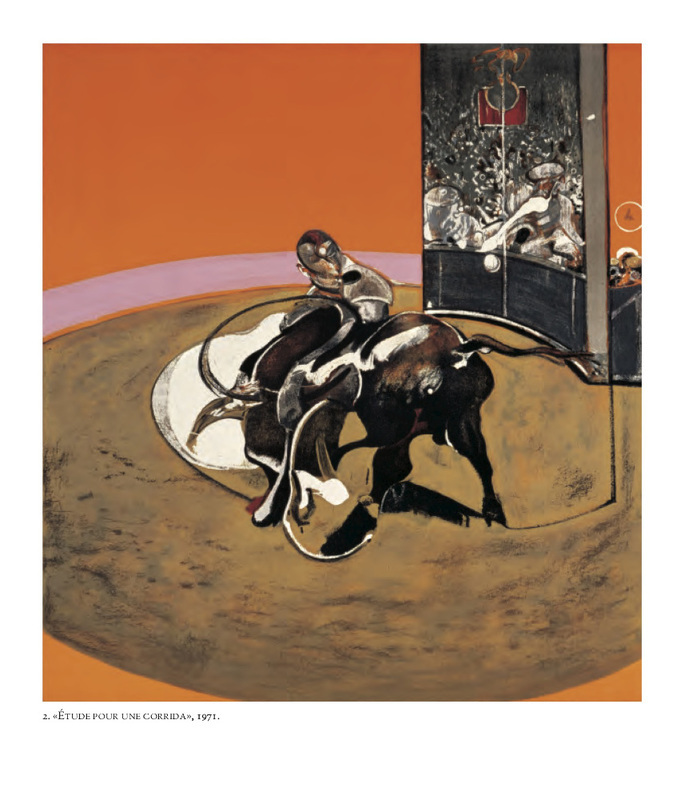 His work has been the subject of numerous major retrospectives most notably at the Metropolitan Museum, New York (1995), Scottish National Gallery of Modern Art, Edinburgh (2002) Tate Britain, London (2006), The Irish Museum of Modern Art, Dublin (2006) and the Reina Sofia, Madrid (2007). His paintings and prints are held by most major museums including Tate, London; British Museum, London; Metropolitan Museum, New York; MoMA, New York and Philadelphia Museum of Art. He designed the set and costumes for several opera and ballet productions including most recently Layla and Majnun performed by the Mark Morris Dance company in 2016. He was knighted in 1992, awarded the Shakespeare Prize in Hamburg in 1997, and made a Companion of Honour in 2002. It's inception was based on a rhythmic progression of simple geometric forms that established position and relationship to one another and the whole. The right side represents an upward progression of understanding & development in the fields of applied knowledge. "MISSOURI PLANES" 24"x 72" oil on panel 2016 - $7200. Glenn Goldberg, “Afternoon” (2016), acrylic, gesso, ink, and pencil on canvas, 60 x 40 in. LOS ANGELES — My four-year-old sometimes plants his feet against my middle-aged chest and pushes off as though my body were bedrock. Glenn Goldberg does the same thing with his chosen iconography: generic images of birds, dogs, flowers, rainbows, and rubber duckies, the sorts of things you’d expect to find decorating a Middle-American house alongside garden gnomes, cross-stitch homilies, and perhaps a Norman Rockwell calendar. In short, 1950s white America’s vision of cozy domesticity. Goldberg seizes these worn-out clichés that would seem unable to support weight and uses them to unexpectedly launch himself into painting. After a show in New York at Betty Cuningham Gallery last year of works entirely in grisaille, he’s exhibiting in LA for the first time in 30 years with a colorful, albeit restrained, palette. At Charlie James Gallery, his hues are desaturated and soaked into the canvas through repeated thin washes. The 2015 paintings shown in New York were wrought in tightly interlocking designs filling the rectangle almost to bursting, with collisions of pattern that verged on the psychedelic. 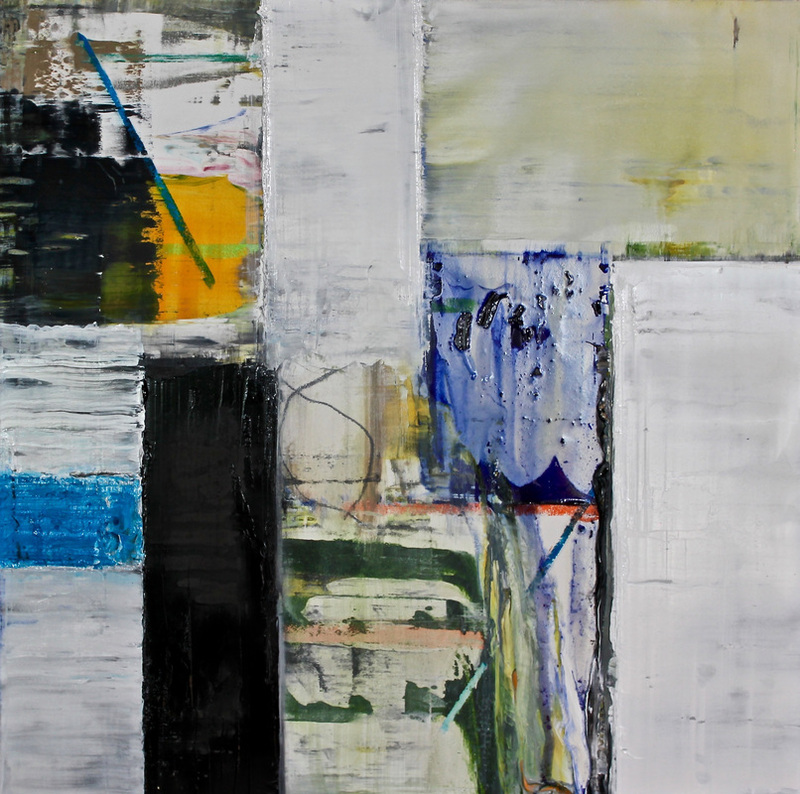 In the new body of work (all made in 2016), Goldberg empties out the canvas significantly by using fewer geometric divisions and less density of mark. The effect is to subject optical pleasure to stringent rigor. As I stood among his paintings, I became physically aware of a subtle conflict between sensual thrill and intellectual restraint. 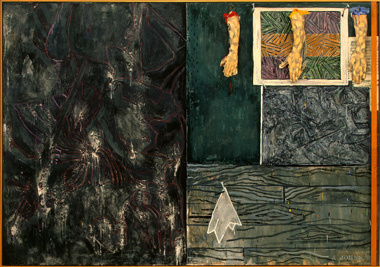 Goldberg’s flat, dry painting technique makes his birds, dogs, and other forms cool and impersonal. The only feature he grants them is their eyes, painted as small white circles or flowers, with a black dot for each pupil. Eyes allow the figures to become screens for psychological projection: the bird melancholic, the dog confrontational, the rubber ducky just a little too pleased with itself. But these associations are muted by the work’s dominating formal structure. 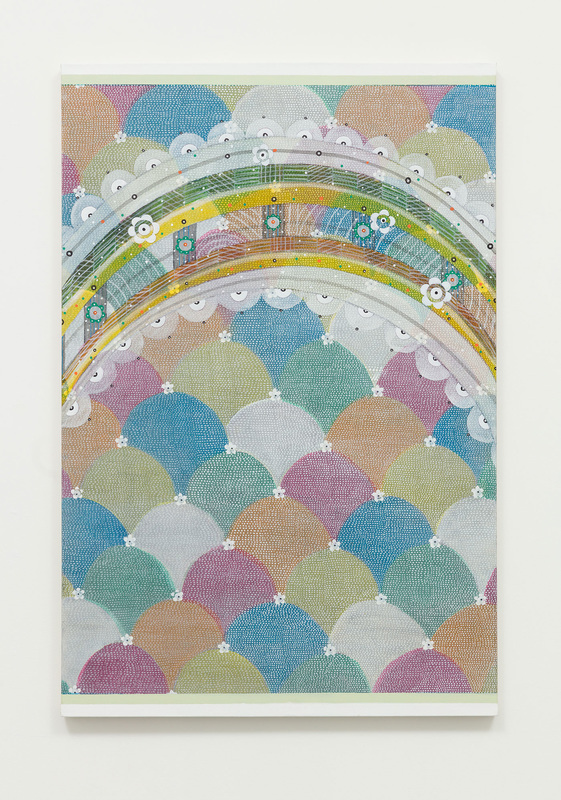 In three canvases, Goldberg extends a loosely stylized rainbow across a fish-scale pattern suggesting breasts or mounds. 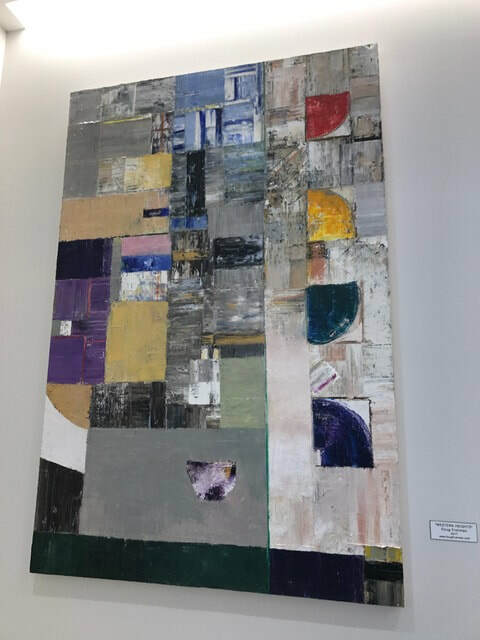 Two of the pieces, “Up There” and “Afternoon,” are done in washed-out pastels, while “Somewhere (2)” features an array of richer blues, purples, greens, and ochres. The allover compositions are anchored by the rainbow’s arc across the upper half of the rectangle. The design could have been carried out exactingly, but Goldberg works it with a free hand, his shapes approximate rather than precise, all covered with staccato dots and dashes that vary in size and placement, emphasizing the artist’s human agency in the picture (he also leaves his initial graphite lines visible). The pieces evidence a merger of his interests in Japanese Kimono fabric designs and American folk art traditions, a blend that places him in company with artists such as Chuck Close, who deploy systems of rules and patterns that are bent to the spontaneity of the hand’s dialogue with the eye. “Okay (Blue)” and “Still OK” have pronounced figure/ground relationships, a very different compositional strategy. In “Okay (Blue)” a rubber ducky shares the foreground with a highly stylized vertical stalk of plant, vaguely resembling bamboo, while the background is done in quiet pastels and lots of tiny dash marks. The duck is a dark, transparent blue sitting dramatically on the image’s surface, while in “Still OK” the duck is transparent white and seems to occupy a space between the foregrounded colorful plant stalk and the patterning of the background. They are both striking works. While painting a rubber ducky would seem to leave little choice but exaggerating the cliché in the ironic voice prevalent among younger artists, Goldberg manages to sublimate those associations and give the image new life through formal abstraction. 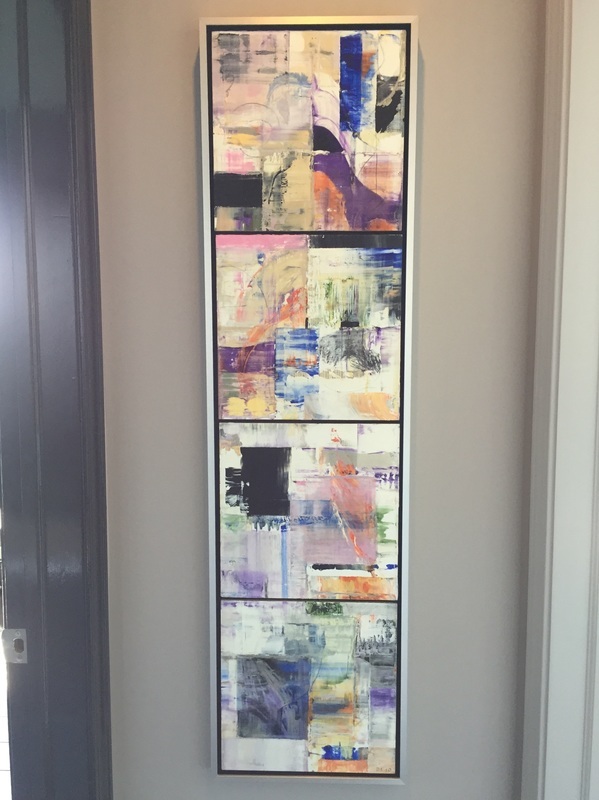 All the paintings feature unusual top and bottom margins that Goldberg either leaves blank or turns into a distinctly patterned border. 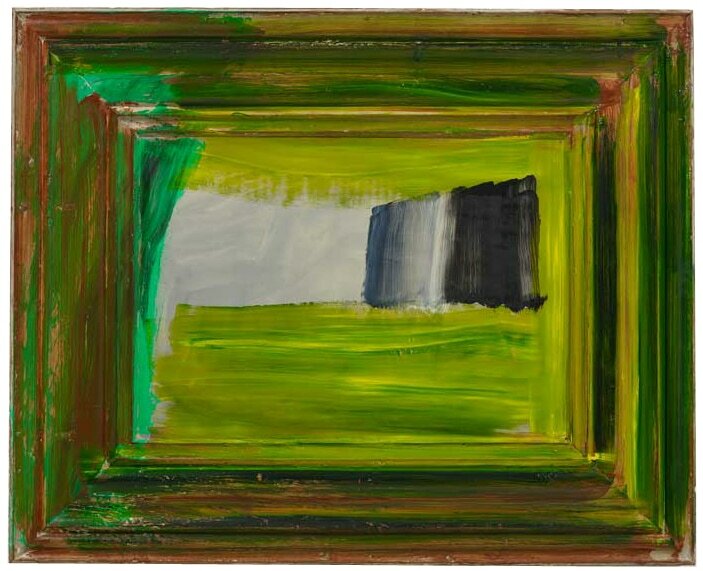 These borders perform the modernist function of asserting each work’s status as an object, rather than a window, but to my eye the aesthetic success of the borders in relation to the paintings they frame is uneven, sometimes completely convincing while at others a bit clunky. Their use, however, evinces Goldberg’s refusal to take the easy road — the borders undermine the works’ seductive qualities, lest we forget that painting is a philosophical endeavor. Perhaps this explains why he keeps his paint so lean, giving his canvases an airy, almost ethereal quality — their existence as thoughts looms as large, or larger than, their presence as matter. The gallery also has a room full of drawings, making for an interesting comparison. The small works on paper (each one is 15 x 12 inches) repeat the vertical format of Goldberg’s paintings, but in miniature. Unlike the canvases, the drawings revel in rich color and are minimally patterned. They feel like Goldberg’s playground, a place where he discards his self-imposed rules and shoots from the hip, allowing possibilities to quickly emerge. Yet for all their delights, the works on paper lack the frisson of his paintings, where Goldberg combines opposing impulses and holds them together with the force of his will. 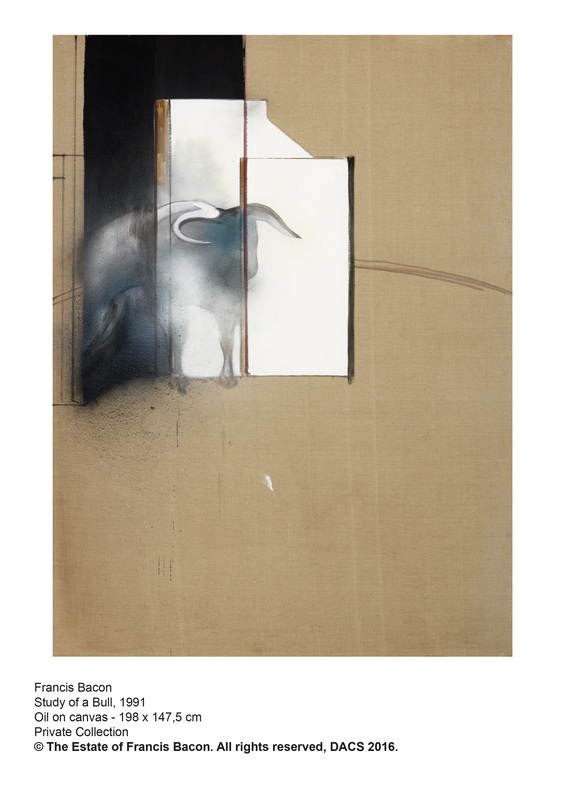 work, the image showed a fading bull and using dust mixed with his paints. This Summer has been a productive one. We presented at ART HAMPTONS, NY art fair with AiBo Gallery and made one collector very happy. 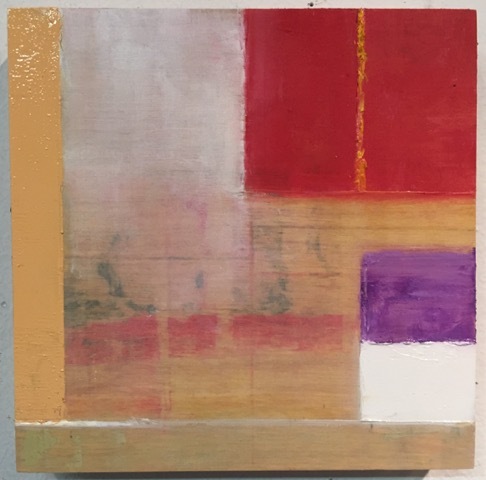 We continued working in the studio on smaller pieces, 12"x 12" and several 6"x 6" studies. The highlight of the summer so far has been working with an astute collector who responded strongly to one of my favorite pieces "PANDORA". He had the insight to suggest re-configuring the horizontal orientation to a vertical format. The end result was a real knock-out. 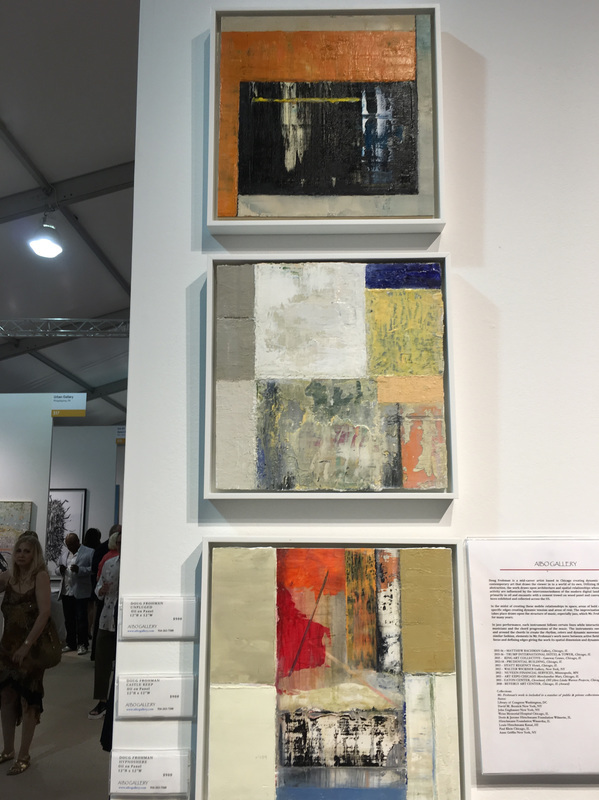 I was pleased with how well the 3 independent 12"x12" wood panels formed a vertical column on display at AiBO Gallery (Booth 233) at this weekend's ART HAMPTONS Art Fair in Bridgehampton. ALL 3 PIECES SOLD! Will see my friend NY artist, Ford Crull - http://aibogallery.com/ford-crull and meet with Glen Aber, Director of Aibo Gallery, Greenwich, CT. The gallery will be featuring new work from my "Particles" series, www.dougfrohman.com/particles.html at 2 upcoming Art Fairs, Context New York in May and Art Hamptons in June 2016. http://aibogallery.com/upcoming-shows.